Google intends to ready the technology for a marketable self-driving car by 2020, but it may never manufacture vehicles itself. SAN FRANCISCO -- Google's self-driving car team is expanding and hiring more people with automotive industry expertise, underscoring the company's determination to move the division past the experimental stage. The operation now employs at least 170 workers, according to a Reuters review of their profiles on LinkedIn, the business-oriented social network. Many are software and systems engineers, and some come from other departments at Google. More than 40 of the employees listed on LinkedIn have previous automotive industry experience, with skills ranging from exterior design to manufacturing. They hail from a wide range of companies, including Tesla Motors, Ford Motor Co. and General Motors Co.
Google has not disclosed details about the size or composition of its self-driving car team, and Johnny Luu, spokesman for Google's car team, declined to comment. The team could have additional members who do not publish profiles on LinkedIn. Google has said previously that it intends to ready the technology for a marketable self-driving car by 2020, but it may never manufacture vehicles itself. The tech giant is more likely to contract out manufacturing -- much like Apple does with the iPhone -- or to license technology to existing car manufacturers, automotive industry experts said. Licensing would follow the model Google has used with its Android operating system for mobile devices. In the past four weeks, Google has advertised nearly 40 new positions on the team, and many are related to manufacturing. The team currently has six people with such experience, including purchasing, supplier development and supply chain management. Hires with manufacturing skills could help Google find and coordinate with a partner to build a vehicle, said Paul Mascarenas, a former Ford executive who is president of FISITA, the International Federation of Engineering Societies. Google is also engaged in discussions with federal and state regulators about how to revise motor vehicle safety standards to accommodate autonomous cars. The competition for technical talent is intensifying as tech and automotive companies race to build driverless vehicles. Beyond Google, the players include Tesla, established car makers such as Daimler AG and GM and, and technology companies such as Apple Inc. and Uber Technologies Inc.
Google's team is being assembled by John Krafcik, an industry veteran who previously headed Hyundai Motor Co.'s U.S. operations and is an expert in product development and manufacturing. Krafcik joined Google in September 2015. Another senior executive with previous automotive experience, Paul Luskin, was hired last month as operations manager, according to his Linkedin profile. An engineer with stints at Jaguar Cars, Ford and Japanese supplier Denso Corp., Luskin most recently was president of Ricardo Defense Systems, a unit of Britain's Ricardo, according to the Linkedin profile. Google hired industry veteran Andy Warburton in July to head the vehicle engineering team, according to his Linkedin profile. Warburton spent two years as a senior engineering manager at Tesla and 16 years as an engineering manager at Jaguar. A third auto veteran, Sameer Kshisagar, joined Google in November as head of global supply management on the self-driving car team. Kshisagar is a manufacturing expert who previously worked for GM, according to his Linkedin profile. Luskin, Warburton and Kshisagar did not respond to requests for comment. Google's self-driving car group also has tapped people with experience beyond the auto industry, including aerospace (Boeing, SpaceX, Jet Propulsion Lab) and electronics (Intel, Samsung, Motorola), according to LinkedIn profiles. Krafcik and Chris Urmson, director of the car team, have said they want to forge partnerships with established automakers and others to build vehicles. Krafcik made a public pitch for alliances at an auto industry conference in Detroit in January. 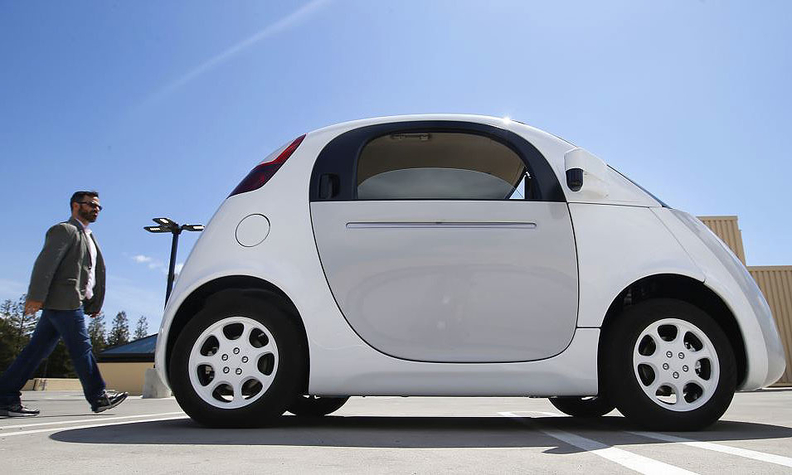 However, Google may have to look farther than the auto industry to find a manufacturing partner, said Raj Rajkumar, a Carnegie-Mellon University professor who advises companies on self-driving car development. The tug-of-war over who controls -- and profits from -- the stream of user data in self-driving cars is "an inherent and fundamental conflict" between Google and traditional automakers, Rajkumar said. Instead, Google may choose to build its own engineering and design prototypes, then partner with a Chinese automaker or an Asian contractor such as Hon Hai Precision Industry's Foxconn Technology Co. that wants to enter the automotive field, several experts said. Michael Tracy, a Michigan-based auto manufacturing consultant, said Google sees the potential of several different revenue streams from its self-driving technology, including licensing its mapping database and vehicle control software, as well as an integrated package of software, sensors and actuators that would form the backbone of a self-driving vehicle. The least likely prospect is that Google will manufacture its own vehicles, Tracy said, due to the massive expenditures required and the stiff competition from established automakers.